Last month on this blog, I included the low incidence to date of section 150 penalties for non-payment of an employment tribunal (ET) award – just 37 penalty notices, as of 4 November, according to BEIS’s answer to a parliamentary question (PQ) by shadow justice minister Lord Beecham – as evidence of significant changes in the nature and quality of ET claims since the introduction of ET fees in July 2013. And, yesterday, thanks to a further PQ by Lord Beecham, we learnt that the number of penalty notices issued has since increased to 60 (a HT to Daniel Barnett for drawing the PQ answer to my attention). As BEIS has noted previously, in its answer to a PQ by Caroline Lucas MP, “warning notices are issued in response to complaints [about an unpaid ET award] and can only be issued 42 days after the original award was made”, and “penalty notices are issued 28 days after that if payment is not made in the interim”. As a result, BEIS did not issue its first penalty notices until mid-September. Which means the 60 s150 penalty notices issued to date were issued over a period of about three months. In other words, BEIS is currently issuing s150 penalty notices at the rate of about 20 per month. Of course, it’s still early days. The s150 penalty regime only came into force on 6 April, and new policies that depend on public awareness and understanding always take time to ratchet up to full speed. But, according to the official ET statistics for the two most recent quarters, each month about 750 ET claims result in an award to the claimant. So, at first glance, there is some reason to conclude that, with its justice-denying ET fees, the Ministry of Justice has heroically solved the long-standing problem of ET awards going unpaid by employers. As recently as 2013 (just before the introduction of ET fees), research by BEIS revealed (or, more accurately, confirmed previous research by the Ministry of Justice in 2008) that only half (53%) of claimants received their award in full or in part without having to resort to enforcement action, and one in three (35%) never received any money at all. However, the number of s150 penalty notices issued does not tell us the whole story. For, as noted above, at least 28 days before a penalty notice gets issued by BEIS, the employer receives a warning notice. And it is clear that, as one would expect, in some cases the issuing of a warning notice is sufficient to ensure payment of the unpaid ET award. Indeed, we can see this from the answers to the PQs cited above. In its most recent answer to Lord Beecham, BEIS states that “as a result of the [s150] penalty regime, the Department has secured £83,245.52 in previously unpaid awards for applicants”. 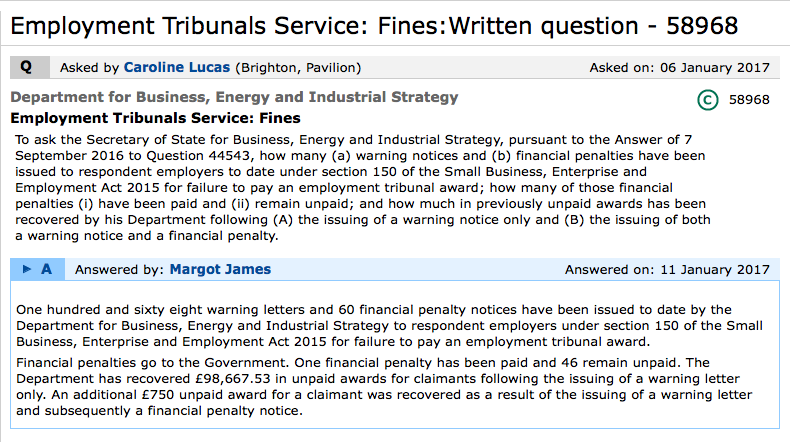 But we already knew, from BEIS’s answer of 7 September to Caroline Lucas’ PQ, that “the issue of warning notices has led to ten claims being settled equating to over £50,000 of previously unpaid tribunal awards”. At that time, remember, not a single penalty notice had been issued. In other words, at least 60% – possibly much more – of that £83,245.52 was secured by means of warning notices alone. So, we really need to know a bit more about the impact of the s150 penalty regime before we can draw any firm conclusions. In particular, we need to know how many warning notices have been issued by BEIS, and in how many cases the warning notice led to payment (in full or in part) of the unpaid award, without need for a penalty notice. Fortunately, I anticipate further PQs being tabled in the New Year. Watch this space. Update (5 January): Yesterday, thanks to yet another PQ by shadow justice minister Jeremy Beecham, we learnt that 164 warning notices have been issued to date. Which is 102 more than had been issued as of 7 September (when, according to BEIS’s answer to the PQ by Caroline Lucas, 62 had been issued since 6 April 2016). In other words, BEIS is currently issuing s150 warning notices at a rate of about 25 per month. So, either the rate of non-compliance with ET awards has fallen from 47% prior to the introduction of fees in July 2013, to just 3.3% now – that is, the Ministry of Injustice has pretty much solved the problem of non-payment of awards – OR the s150 enforcement regime is not being used by claimants when it should be. No doubt the Ministry’s forthcoming, much-anticipated review of the fees will tell us which it is. Further update (11 January): As I anticipated, above, a further PQ was tabled by Caroline Lucas on 6 January, and has been answered by BEIS today. From this answer, we learn: that 168 warning notices, and 60 penalty notices, have now been issued; that, as I surmised above, of the total of £99,417.53 in unpaid awards recovered by BEIS to date, no less than 99.2% was recovered following the issuing of a warning notice only, without need for a penalty notice; and that only one financial penalty has been paid to date. Also, a further PQ has been tabled by Green Party peer Jenny Jones in the House of Lords, requesting the number of previously unpaid awards represented by the sum of £83,245.52 given in the 20 December Answer to Lord Beecham’s PQ (see above); an answer is awaited. This entry was posted in Justice and tagged Employment tribunals, ET fees, s150 penalties, Unpaid ET awards. Bookmark the permalink.